MEMORIES of childhood, the pupils we shared classrooms with and others who lived in the same street are often vivid in the mind years later. Bridget Pelling, aged 66, was raised by foster parents Alfred and Freda Eason (nee Russell) at 3 Ormonde Road, Horsell. Her neighbour at number 5 she recalls as being Susan Palmer (married name Hamilton). Others included James Elton, Peter Carter (who at some time had a pet shop at Anchor Hill, Knaphill), and Andrew Gold, the latter living in a big house that adjoined her house at the bottom of the garden. Bridget went to Goldsworth School and left in 1967. Her foster mother had also gone to the school. 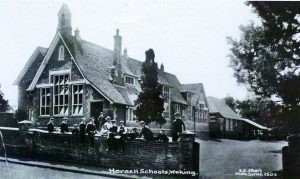 However, her foster father went to Horsell School, and while there he wrote some verse about it. It appears to be in the form of a school poem.